Winter is here, which means it’s time to think about how you will protect your pooch in the cold Toronto weather. A huge misconception is that dogs are fine in cold weather because of their fur and paw pads – this couldn’t be more wrong! 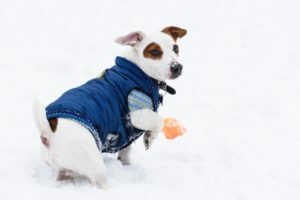 Dogs are just as susceptible to frostbite and hypothermia as we are, and as their dog moms and dads, we have to protect them. Before you go out on your walks with your dog, pick up some winter gear like jackets or boots. Constantly going from the cold outdoors to a warm, dry home can cause skin to get dry, causing it to flake and chap. You can prevent this by keeping your home humidified! Make sure your pooch is hydrated! During winter, your dog will burn through more energy trying to keep themselves warm, which can lead to dehydration. Make sure your furry family member is getting enough water by keeping their water bowls filled or carrying around a portable water dish. This is an overlooked maintenance step during the winter, but it’s so important! Long nails can make your pooch slip on ice easier. Plus, longer nails can break off, which is painful and adds the risk of infection with all the salt and chemicals on the sidewalks. 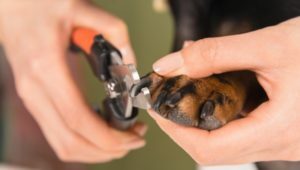 The best way to keep your dog’s paws safe is to get them properly trimmed by a professional! At The Dog Market, we have an expert team that can help your pooch feel safe and comfortable while he or she gets her nails trimmed. Come by our store in Toronto to get your winter dog gear! Winter is tough on dogs, but it doesn’t have to be. At The Dog Market, we have all the essentials your dog will need to stay safe, warm, comfortable and happy all winter long.